Vancouver Singers present bluegrass, Bernstein in March concerts | Audio and video stories from Southwest Washington. 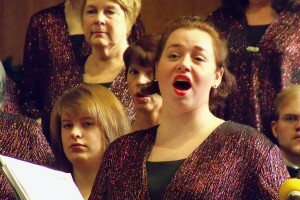 Vancouver Singers, an all-volunteer community choir, will present its spring concerts in March. Vancouver Singers perform March 24 and 25. The performances of “From Bluegrass to Bernstein: An American Songbook,” will take place March 24 and 25. The all-American concert will be directed by Jana Hart and assistant director Kirsten Hart, and will feature bluegrass ballads and “The World Beloved: A Bluegrass Mass” by Carol Barnett and featuring a Northwest bluegrass band. Joining the Vancouver Singers for the event will be Skyview High School Concert Choir, directed by Philip Denton. The winner of this year’s Vancouver Singers’ scholarship will also perform a solo. The nonprofit choir, which has about 100 members, was founded in 1963.
and Sunday, March 25, 3 p.m.
Tickets: General admission $15, students and seniors $10, children under 10 free. Can be purchased at Beacock Music, Music World in Hazel Dell, the Vancouver Singers website, or at the door.